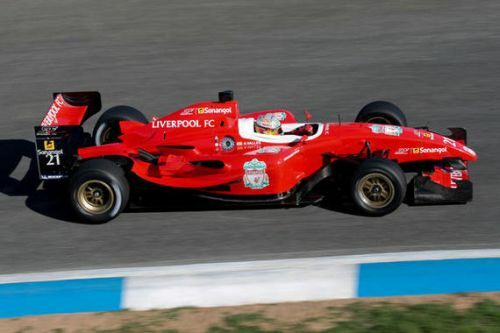 Liverpool extended their lead at the top of the Superleague Formula by Sonangol league table in Estoril, Portugal thanks to Adrian Valles’ second and ninth place finishes in the day’s two races. Having qualified for the Super Final after scoring the third highest points total of the weekend, the Spaniard then won himself and the team €30,000 for finishing third. Valles started third and did well to maintain his position on the run down to the first corner after making contact with pole man Antonio Pizzonia (Corinthians). The top three, headed by Olympiacos’ Esteban Guerrieri, then ran nose to tail in the opening laps, dropping the chasing pack in the process. Less than two seconds separated Liverpool and Olympiacos when the pair pitted at the end of lap eight. Excellent wheel work from the Reds’ crew however erased the gap, allowing Valles to come out comfortably clear. And there was a double reward one lap later when Corinthians emerged from their stop also behind, leaving Liverpool at the head of the field. Valles then set about establishing a gap back to his pursuers. Guerrieri however was on a charge and having used traffic to his advantage to dispatch Corinthians, set off in pursuit. With his tyres worn and brakes fading, Valles had little chance of keeping the marauding Argentinean at bay, conceding the lead with just three minutes remaining. The second race proved less straightforward after starting 16th of the 18 runners due to the fully reverse grid rule which sees the top performers from race one starting towards the rear. A bottle neck effect at the first corner can end a driver’s race as quickly as it began and Valles, fighting in the midfield, did well to make it through unscathed. From there on he began to make headway, fighting back up to 11th before making his obligatory pit stop at the end of lap nine. Another spot was found during the stop and when title rivals FC Basel received a 25 second penalty, ninth was also his. With Tottenham Hotspur, who had been second in the championship prior to the start, failing to finish, Valles was content to save his car and tyres for the Super Final five lap shootout safe in the knowledge that a substantial 58 point cushion at the top of the table was his. Starting third, Valles made a clean start to run second before inheriting the lead when Corinthians ran wide. Former Toro Rosso F1 driver Sebastien Bourdais was right with him though and when the Frenchman shot up his inside, Liverpool was powerless to resist Olympiacos also pushing through. That left Valles third, a position he would hold to the chequered flag. Fellow British club Rangers meanwhile finished fifth and eighth in the two races with Australian John Martin at the wheel. Craig Dolby of Tottenham was eighth in the first race before reliability issues restricted his running to just one lap in the second. Liverpool, Tottenham and Rangers return to Superleague Formula action at Monza, Italy in a month’s time (October 3/4). It’s the transfer of the season: Sébastien Bourdais joins Superleague Formula! Venez supporter le RSC Anderlecht ce week-end à Zolder !